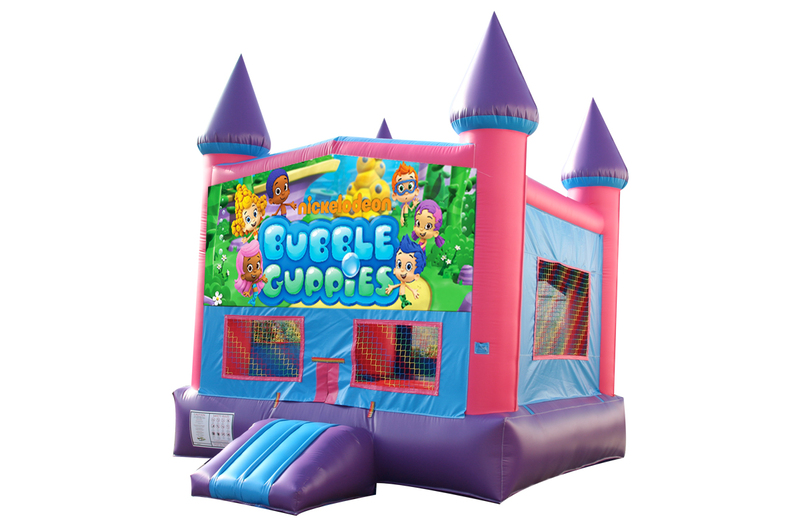 Make an impression at your child’s birthday party with this Bubble Guppies pink and purple fun jump! Join Gil, Molly, Deema, Goby, Oona, Nonny and friends on their next educational adventure! 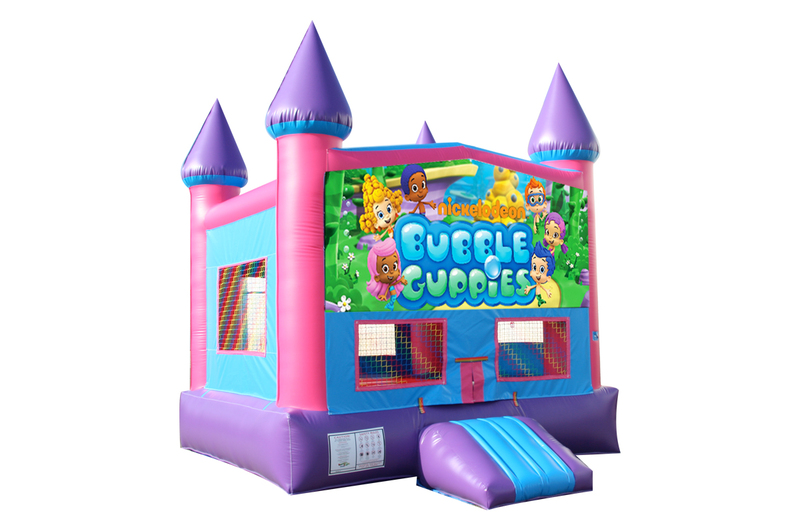 This 15' x 15' inflatable offers 225 square feet of bounce area, as well as a basketball goal (with two balls included) to keep your little ones bouncing all day long! Mesh windows allow adults and spectators to see what's going on inside the inflatable, and a safety ramp at the entrance/exit allows for safe and easy access to the jump. Got Bounce? 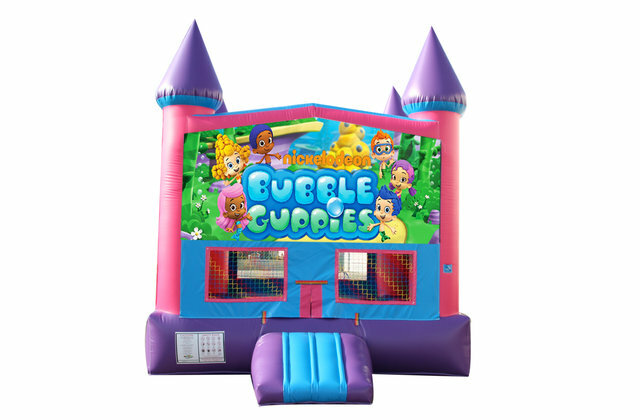 The Bouncing Buddies Bubble Guppies Fun Jump is great for family entertainment, providing the most popular form of amusement for children. Bouncing also puts you in a state of health and fitness, improves your sense of balance, creates an aerobic effect for your heart, strengthens your muscles, and increases the capacity for respiration, resulting in better mental performance! -Inflatable safety ramp on Fun Jumps for easy entrance and exit. -Fun Jump has jump area with basketball goal (two balls included). -Large netted vent windows for air flow and 360 degree viewing. -Safety hatch is on top of inflatable for emergency evacuation. -Adults should always be supervising the kids when they are in the inflatable. -Please limit it to 6 to 8 kids in a time in the inflatable. -Age limit is 3 and up. -All participants must be same size and weight. -No jewelery or sharp objects. -No rough play including wrestling. -Minimum height is 42 inches. -Weight limit is 200 pounds per person. -Overall maximum weight in unit is 800 pounds. -Do Not operate any inflatable moonwalk in 15mph winds or more. Always turn off the inflatable. -Never play in a inflatable moonwalk during rain. -Cement set ups are allowed just need traps and sand bags. We cannot set up on rocks or gravel or uneven cement. -The inflatable requires a separate 110 outlet within 75' of set up.